Jeeva Klui Resort is the new accommodation that located in Klui village Lombok. Jeeva Klui’s tropical allure and Lombok design embraces quaint touches of traditional village life. Great care was taken to conceptualize a resort with strong emphasis on providing a relaxing holiday experience, while at the same time being socially and environmentally responsible through sensitive design and green practices. Jeeva Klui‘s total 27 suites include 18 one and two-story beach front suites, six two-story garden suites and partial ocean view and three pool villas. All rooms have a private terrace with an oversized outdoor day bed and are equipped with either 32 or 40 inch flat screen televisions. All suites are a spacious 54 m2 although the layouts of the suites vary with the type of suite. WiFi is available in the public areas and in the pool suites. 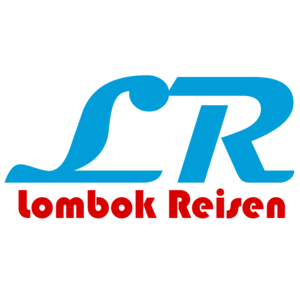 Jeeva Klui works with local guides and small businesses to arrange bicycle and driving tours around Lombok as well as day trips to the Gili Islands. Jeeva Klui manages a private 53 hectare forest conservation reserve in East Lombok near Tanjung Ringgit. Tanjung Ringgit is renowned for high ocean cliffs and pristine deserted beaches. Picnic day trips to the reserve area can be arranged at Jeeva Klui. There are no bathroom facilities, running water, or electricity in the reserve area. Jeeva Klui is currently developing plans to begin offering basic over night facilities in the reserve area in mid 2011. The Warung – a neighborhood open air restaurant – is a feature of Indonesian daily life. The Waroeng at Jeeva Klui is just that, a relaxed open air restaurant and the center of daily life at Jeeva Klui. Located on the oceanfront verandah and overlooking the swimming pool, the beach and the ocean beyond, Waroeng’s open air style and casual dining attitude reflects shades of an Indonesian eatery of days gone by. Open throughout the day, guests are invited to enjoy a selection of Western and Asian dishes at the Waroeng long table, under the Banyan tree on the outdoor dining verandah, or on their own private terrace. Waroeng offers a limited room service menu for late night dining. Wallace is a casual air-conditioned library and lounging space where you can sit and relax over a cup of coffee and enjoy a dessert or some tapas. The perfect setting to laze and enjoy a peaceful moment exploring the library of novels, catalogue of DVDs available for in room viewing, leafing through reference books on the history, art and culture of Indonesia. Take a moment to surf the web and check your email – if you must – on the resort’s computer, play a board game with friends or enjoy an after dinner drink in the evening. 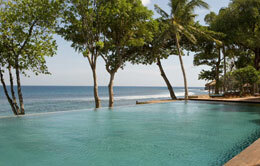 The swimming pool is located in the center of the resort near Waroeng and measures nearly 25 meters in length. Soak up the sun on the timber deck, cool off in the ocean or take a dip in the pool, it’s all just a few steps away. Lombok has a rich tradition of arts and crafts. A new boutique shop is being built along with the expansion of the resort and will be opening in mid June. A limited selection of handicrafts including jewelry and textiles, as well as a variety of convenience items, is available in the reception area. Watch the sun set behind Bali’s Mount Agung and be lulled to sleep by the sound of the waves. All Ananda Segarra Suites are located directly on Jeeva Klui’s 180 meter long beach and feature large, private terraces furnished with oversized day beds. The overall color palette of the suites combines crisp white with natural bamboo and dark, rich woods. 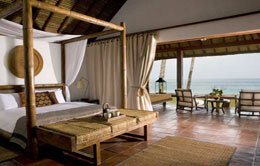 All Ananda Segarra Suites have full ocean views of the Lombok Straits and the islands of Bali. The suites are fully airconditioned and are equipped with flat screen televisions, international cable channels, DVD players, hairdryers and other amenities. All Ananda Pura Suites are located in Jeeva Klui’s tropical gardens and have partial views of the ocean and the Lombok Strait. 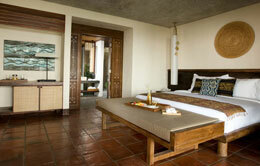 The Ananda Pura Suites feature large, private terraces furnished with oversized day beds. The overall color palette of the suites combines crisp white with natural bamboo and dark, rich woods. The suites are fully airconditioned and are equipped with flat screen televisions, international cable channels, DVD players, hairdryers and other amenities. 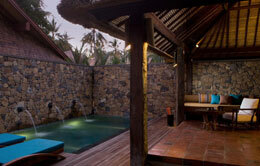 Akasha Pool Suites boast a plunge pool and feature a recycled timber deck with sun loungers in a private compound. Suites have 40″ flat screen televisions, a DVD player, WiFi, and, upon request, an iPod. The suites are equipped with a hair dryer, robes, and a coffee plunger with ground coffee and a selection of special tea blends.